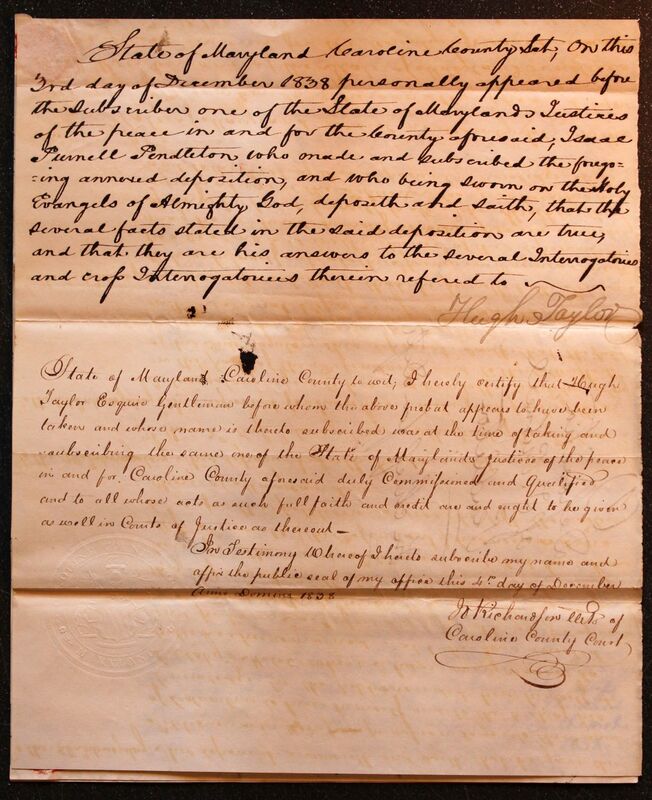 The deposition of Isaac Purnell Pendleton witness of lawful age, on the part of the Defendant. To the 1st Interrogatory. This deponent answereth and saith, that he is acquainted with the parties to the above suit, that he has known them for about twenty five years. To the 2nd Interrogatory. 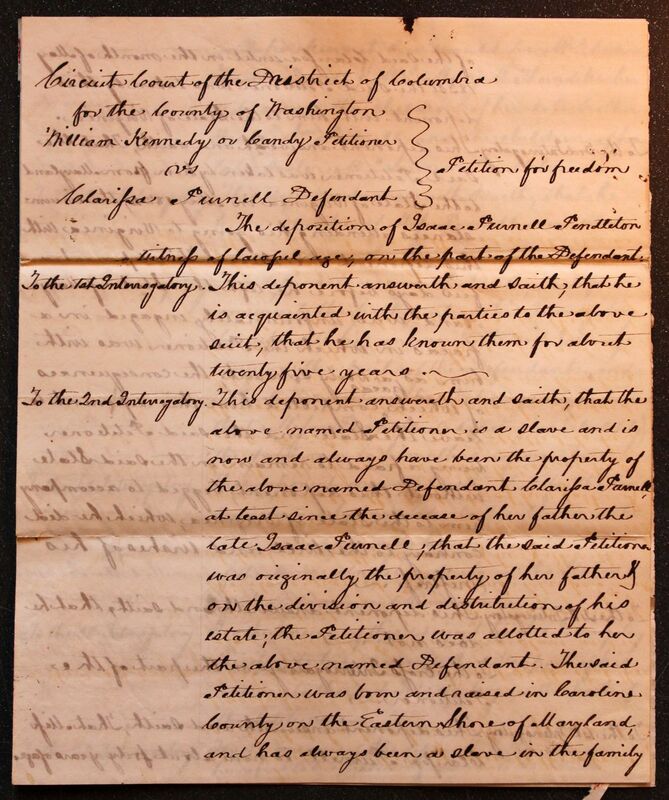 This deponent answereth and saith, that the above named Petitioner is a slave and is now and always have been the property of the above named Defendant Clarissa Purnell, at least since the decease of her father the late Isaac Purnell, that the said Petitioner was originally the property of her father & on the division and distribution of his estate, the Petitioner was allotted to her the above named Defendant. 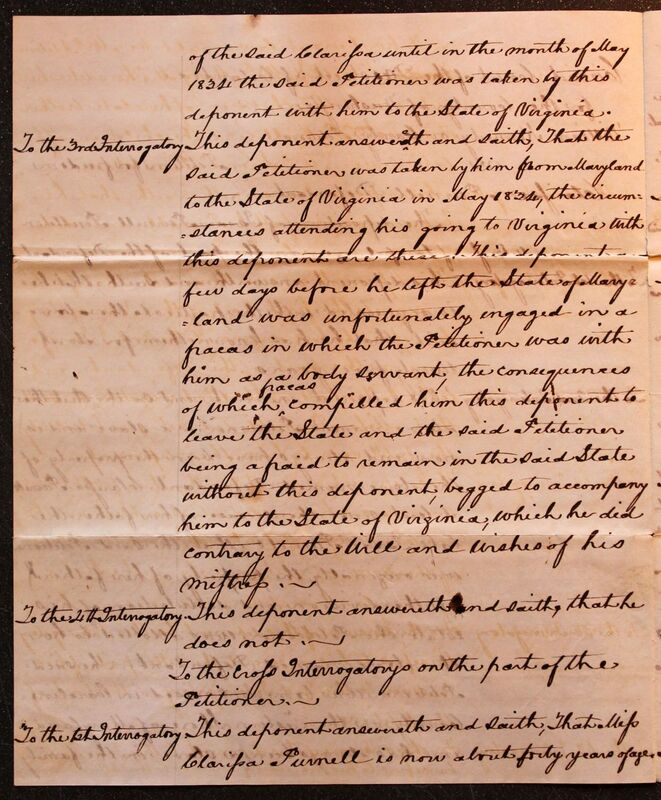 The said Petitioner was born and raised in Caroline County on the Eastern Shore of Maryland, and has always been a slave in the family of the said Clarissa until in the month of May 1834 the said Petitioner was taken by this deponent with him to the State of Virginia. To the 3rd interrogatory. 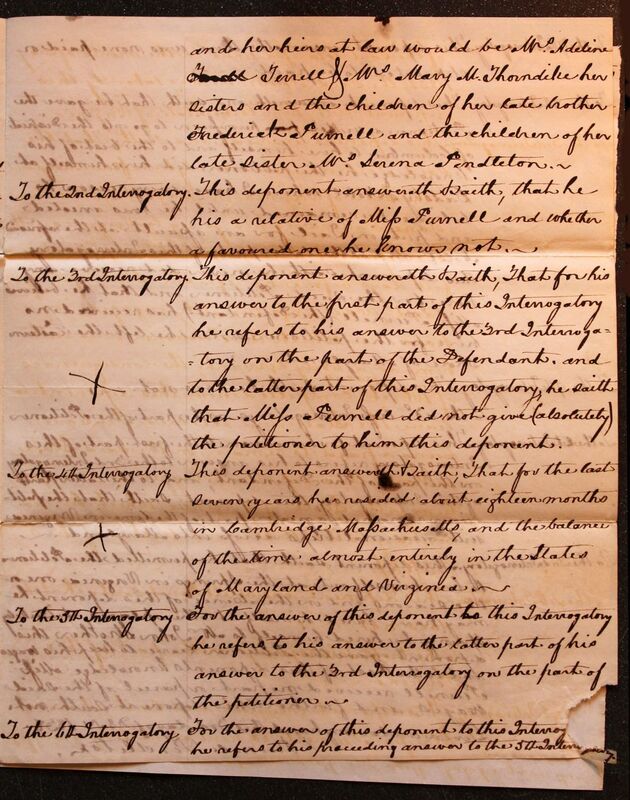 This deponent answereth and saith, That the said Petitioner was taken by him from Maryland to the State of Virginia in May 1834, the circumstances attending his going to Virginia with this deponent are these. This deponent a few days before he left the State of Maryland was unfortunately engaged in a fracas in which the Petitioner was with him as a body servant, the consequences of which fracas compelled him this deponent to leave the State and the said Petitioner being afraid to remain in the said State without this deponent, begged to accompany him to the State of Virginia, which he did contrary to the will and wishes of his Mistress. To the 4th Interrogatory. This deponent answereth and saith, that he does not. To the Cross Interrogatorys on the part of the Petitioner. To the 1st Interrogatory. This deponent answereth and saith, That Miss Clarissa Purnell is now about forty years of age, and her heirs at law would be Mrs Adeline Turill Terrell & Mrs Mary M. Thorndike her sisters and the children of her late brother Frederick Purnell and the children of her late sister Mrs Serena Pendleton. To the 2nd interrogatory. This deponent answereth & saith, that he his a relative of Miss Purnell and whether a favored one he knows not. To the 3rd Interrogatory. 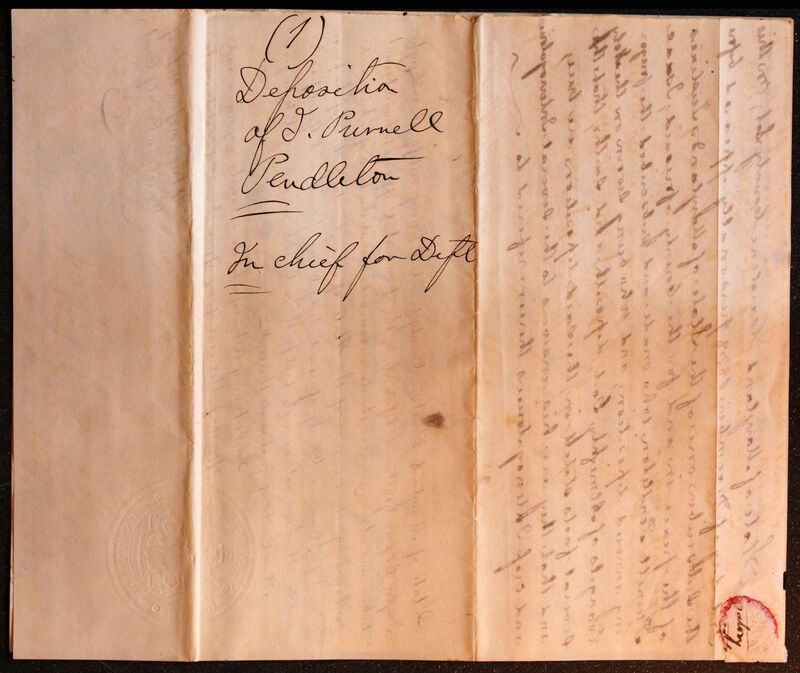 This deponent answereth & saith, That for his answer to the first part of this Interrogatory he refers to his answer to the 3rd interrogatory on the part of the Defendant, and to the latter part of this Interrogatory, he saith that Miss Purnell did not give (absolutely) the petitioner to him this deponent. To the 7th Interrogatory. This deponent answereth, there was none paid or stipulated to be paid. To the 9th Interrogatory. This deponent saith he does not. To the 2nd Interrogatory. 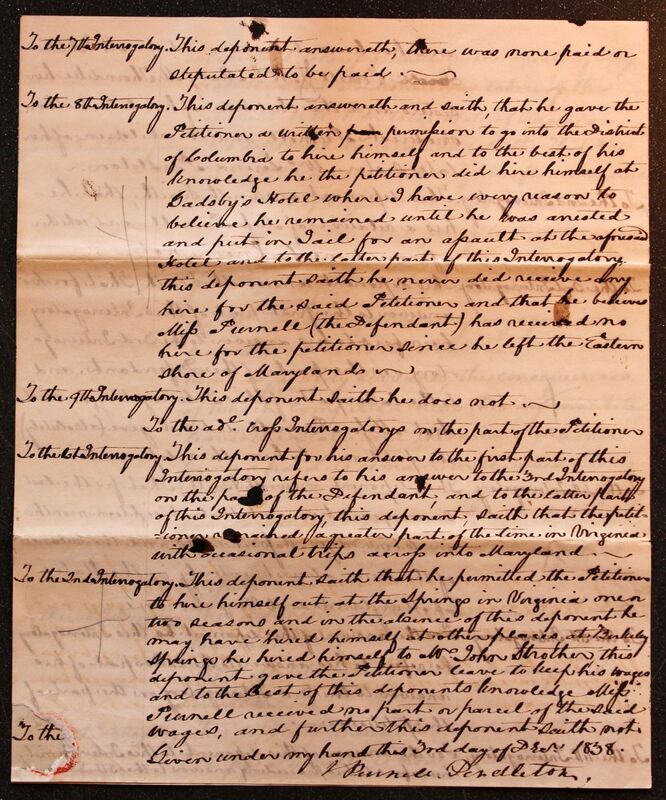 This deponent saith that he permitted the Petitioner to hire himself out at the Springs in Virginia one or two seasons and in the absence of this deponent he may have hired himself at other places at Berkeley Springs he hired himself to Mr John Strother this deponent gave the Petitioner leave to keep his wages and to the best of this deponents knowledge Miss Purnell received no part or parcel of the said wages, and further this deponent saith not. Given under my hand this 3rd day of Decr 1838. State of Maryland Caroline County to wit; I hereby certify that Hugh Taylor Esquire Gentleman before whom the above probat appears the have been taken and whose name is thereto subscribed was at the time of taking and subscribing the same one of the State of Maryland's Justice of the peace in and for Caroline County aforesaid duly Commissioned and qualified and to all whose acts are such full faith and credit are and ought to be given as well in Courts of Justices as thereout.